The following Frequently Asked Questions are available to help answer questions you may have about OnTimeHost services. You may also email Sales@OnTimeHost.Com or use our support form. - Does OnTimeHost use Unix or NT servers? - What do I get with my account? - Do I register my domain name or do you do that for me? - How much disk space do I get for my web pages and graphics? - What are Frontpage extensions and do you support them? - Can I depend on fast downloading speeds for my site visitors? - Do you offer secure server space for transferring credit card information? - What is a "parked" domain and how much does it cost? - Can I upload pages frequently? - How much data transfer do you allow for my site? - What is a CGI-bin and do I get one? 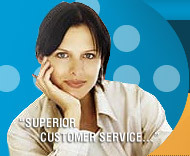 - What is the Point & Click Mail Manager? - What are autoresponders and how many do I get? - What are email aliases and how many can I use? - What about the Traffic Statistical Software? - What about Technical Support? - What kind of Technical Support do you NOT provide? - How do I sign up for an account? - Do you support subdomains or wildcards? - When my domain is registered who will own the domain name? - What is the fee regarding domain name registration? - Do I have to pay the domain name registration fee? - How can I register foreign domain names? - How long does it take for the world to access my domain name? - What can I expect if I am transferring a domain name to OnTimeHost? - How do I know if my domain name is still available? - How do I transfer an existing domain to your server? - What should I do if I do not receive confirmation from Network Solutions regarding my domain transfer request? - How do I transfer an existing domain registered using Register.com or other domain registrar? - How do I contact InterNIC? - When will I receive an invoice? - Are there any setup fees? - Where do I send a check? - How can I find out if my account is past due? - Is there a minimum contract that I must sign up for?